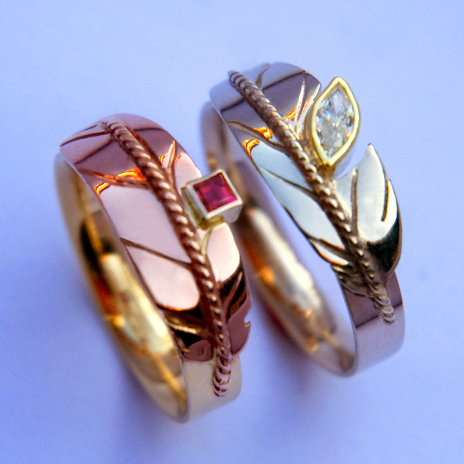 Materials & details: 14K red gold eagle feather on a 14K white gold ring shank, 14K palladium white gold bezel, 0.098 x 0.098 inch (2.5 x 2.5 mm) carré-cut red ruby (left ring); 14K white gold eagle feather on a 14K white gold ring shank, 14K yellow gold bezel, 0.31 ct 0.236 x 0.118 inch (6x3 mm) VVS marquise-cut white diamond or a 0.236 x 0.118 inch (6x3 mm) moissanite stone*** (right ring). What sets this wedding ring set apart from the other rings of our eagle feather collection is the rather exuberant choice of colors and the unusual combination of gemstones - regarding their cut as well as the asymmetrical placing of the mountings. The stylized eagle feathers stand for the search for thruth in all things. The gems, in their diversity regarding color and precious stone cut, symbolize the individualty of the person who's wearing the ring and his or her personal quest for truth. It is as if the gems' sparkling colors are saying: "Be true in everything you do. Be true to yourself and your heart will be filled with faithfulness toward others and with gentleness and patience with what might be a fault in your life partner." N.B. : Persons who hold a Canadian First Nations status card and live and work on their reserve are generally tax exempt. ***Moissanite is a rare gem, a precious gift from our Mother the Earth. It is durable and tough (as it is extremely resistant to scratching, abrasion, breaking, or chipping), and more brilliant (has more rainbow colors) than diamond. Also, it doesn’t have the natural inclusions and cloudiness that diamond has. It is extremely resistant to scratching and abrasion. Diamond is the hardest gemstone used in jewelry but moissanite, with a hardness of 9.25, is harder than all other gemstones including ruby and sapphire. The Moissanite stones that we use in our wedding rings are precisely hand-cut by a master gem cutter to create maximum brilliance which intensifies its ultimate fire and will maintain their unmatched brilliance and fire for life. Last but not least, a Moissanite gemstone costs a fraction of the price of a comparable diamond, which makes our wedding rings much more affordable.